September has never been one of my favourite months. Summer is over and it’s back to school, which for many means the end of playing outdoors and the long, sunny days. 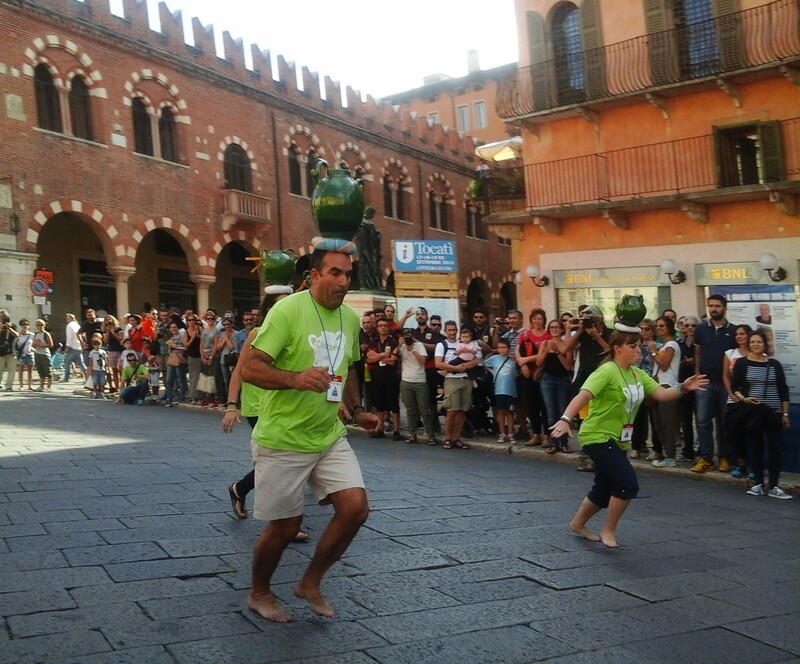 However, for 11 years, the Association of Ancient Games in Verona has been determined to change the melancholy image of this month by organising the “Tocatì” (meaning “your turn” in Venetian dialect), an international festival of traditional games held over three days which transforms the city of Verona into a children’s paradise. 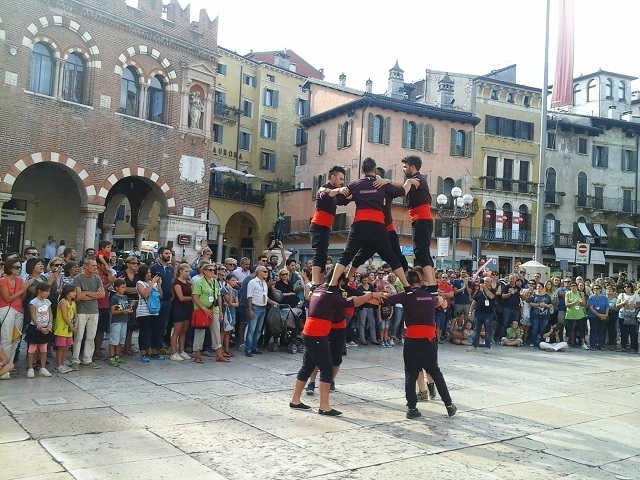 Launched in 2003 with the aim of giving space and meaning back to the games that were once played in the streets and piazzas of Verona, it has now become an unmissable event for tourists and fans of all ages and nationalities. Every year, the festival invites a guest nation to come and share their own heritage of traditional games with the public. I missed the games of Spain, Croatia, Scotland, Greece, Switzerland and Hungary. So I took note, and decided to remedy the situation this year. 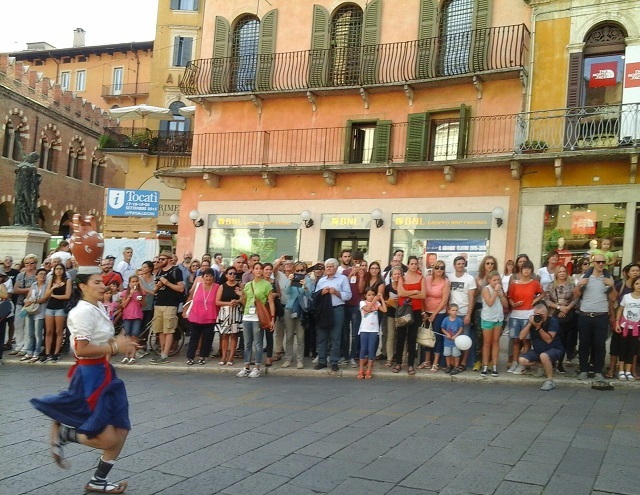 On the evening of the launch, I found myself in Piazza dei Signori near the statue of Dante, ready to immerse myself in the games, music and traditions of Catalonia, the 2015 guest of honour. What can you do at a festival dedicated to games? Play, or watch others playing. I chose to watch, and discovered that Piazza Erbe had been a place for fun and games as far back as Roman times; a small arena that was flooded to entertain the public with reconstructions of famous naval battles. But that’s not all I discovered. 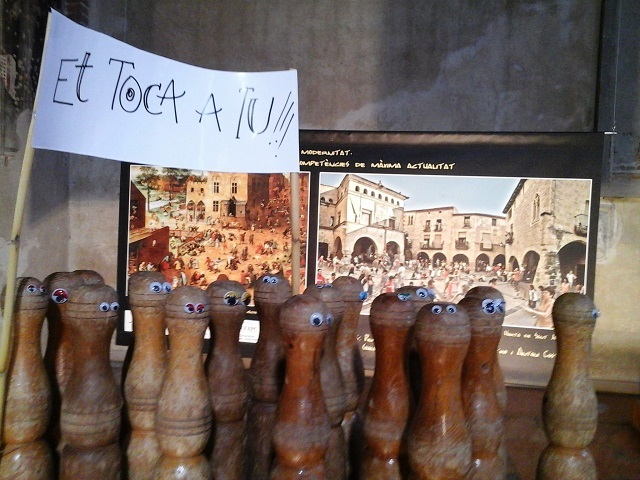 Who would have thought that traditional Catalan games are quite similar to Italian ones? 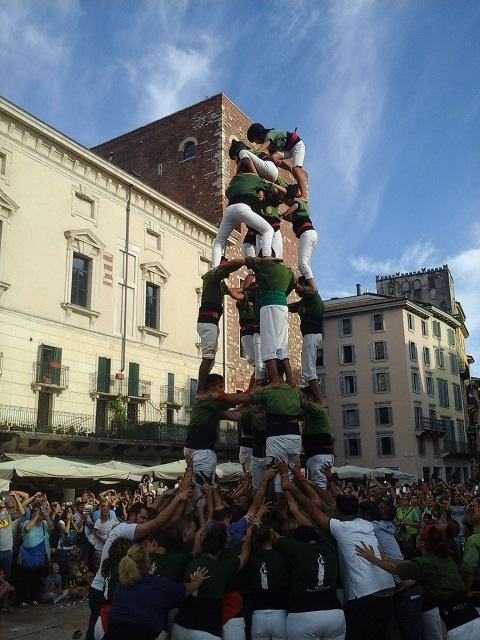 Whilst in the small village of Irsina in the province of Matera, the men attempt to build the “P’zz’cantò”, human towers of two levels that turn in circles to the sound of songs and nursery rhymes, in Alcover (Tarragona) in Catalonia, 120 men, women and children from “Colla Castellera Xiquets” construct the “Castell,” human castles up to 15 metres high, which are on the UNESCO List of Intangible Cultural Heritage. Italian and Catalonian women also appear to share a common history. In times gone by, one of the leisure activities enjoyed by young women in Arpino, in Ciociaria (Lazio) was to compete in a very special race called the “Corsa con la cannata,” or pitcher race. 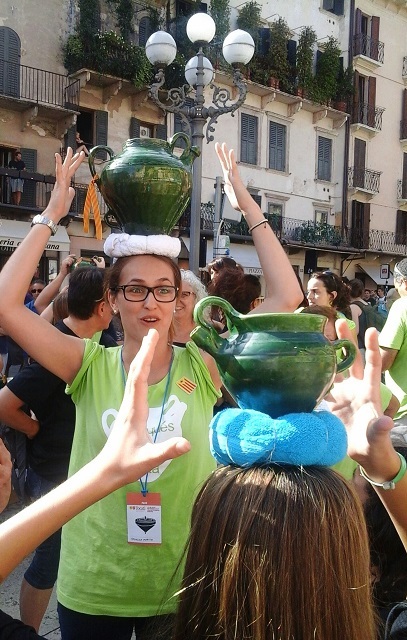 With the human towers and pitcher races, Piazza Erbe becomes a veritable Land of Toys from the Pinocchio adventures! And how about the “Bitlles paralleles” (parallel skittles), which is similar to the thoroughly Sicilian “Gioco della Carrara” brought to Verona by the inhabitants of Pellegrino? 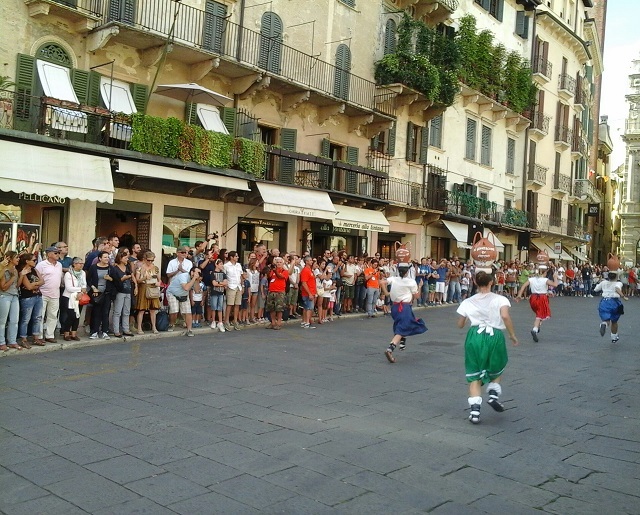 Or the “Pilota al carrer”, a Catalan ball-throwing street game reminiscent of “Farra di Mel” in Belluno or the “Palla Elastica” (elastic ball) from Vallico Sotto in Tuscany? The transition from one game to another was dizzying and as fast as the traditional Catalan music. Each game featured an Italian or Catalan region, and sometimes both! As I was playing, it struck me that the cultural intertwining of the different nations is essentially so tight that it would suggest a shared European cultural heritage centuries old, and maybe too long forgotten. If you’re someone who loves museums, you will have surely visited the “Gioco fra tradizione e modernità” (the interplay of tradition and modernity) in the former church of San Giorgetto and San Pietro Martire located next to the Pisanello frescoes in the church of Santa Anastasia. But I preferred the streets and the small piazzas that were buzzing with teams playing draughts, backgammon, bossa buffona (an amusing wine vessel game), carrom, chess, trisella (throwing wooden balls into slots in a box)… in short, non-stop fun that never takes place on an empty stomach, as all the typical Veronese taverns in the town centre have joined together for the festival to form the “Osteria del Gioco” (Festival Tavern) where you can sample local wines and specialities (from polenta with aged salami to trout with local cheese). The “Latteria ludica”, the games dairy, has also been created for lovers of dairy products and for those who go in search of ancient vegetables saved by the Slow Food movement, such as the “Pero Misso” (Lessinia’s Pear) and the “Mela Decio” (an ancient form of apple); both wonderfully mouth-watering fruit varieties. 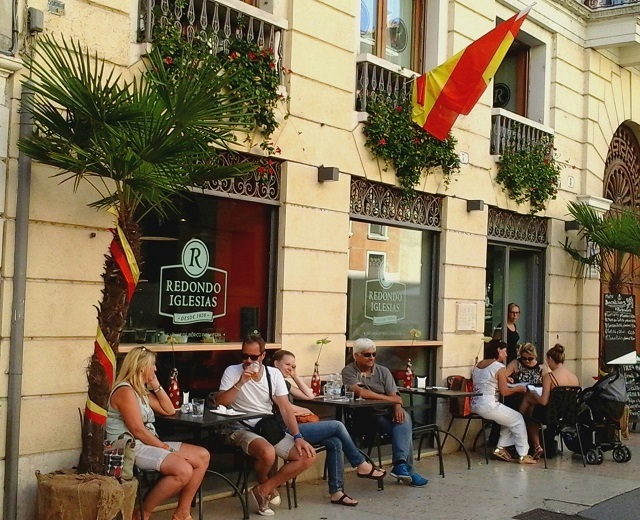 With such an extensive schedule, there’s a risk that you’ll never want to leave this Wonderland, and maybe after enjoying some Catalan cuisine and a nice glass of wine from Verona there are some things I’ve forgotten to mention. For example, that this is the first certified eco-friendly and sustainable festival in Italy, and if you want to bring your bicycle next year, you’ll find marked routes and a parking area reserved for cyclists. 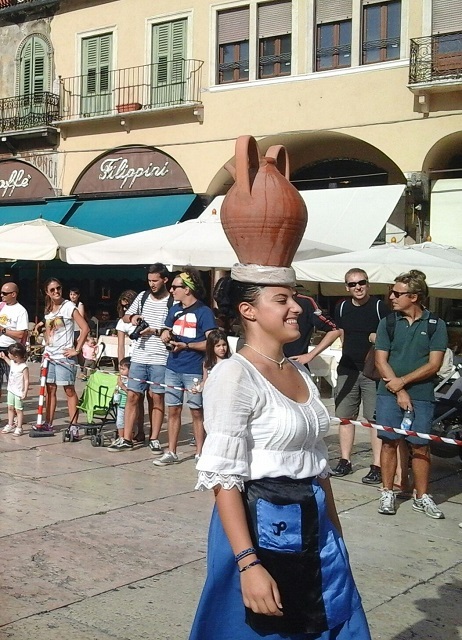 Simply make a date for September 2016 when Shakespeare’s “fair Verona” will host another Tocatì with games, music, creativity and a party to which everyone is invited. opera. With an eye for guerrilla marketing, she loves Italian culture, French cinema, and British irony. Concierge tip: Why not make a day trip to Verona from Baglioni Hotel Luna in Venice and return in good time for an intimate luxury dinner at Canova Restaurant, winner of the prestigious Fogher d’Oro award.